Mrs. Murphy’s class at Centennial Public School created posters to ensure Syrian newcomers feel welcome in their new home. Limestone continues to welcome and support Syrian newcomers who now call the Kingston area home. Working with the Kingston Immigration Partnership (KIP), school staff work to ensure a smooth transition for refugees including providing education or educational supports to school-aged children. The process to get children registered for school is a collaborative process that involves a settlement worker, interpreters as required, school staff and any sponsoring agencies. Transition meetings include an assessment of where the student is in terms of English language skills and what schooling, if any, they may have had. Tours of the school are provided, meetings with teachers and an opportunity to discuss any cultural or religions considerations. So far, says Pettingill, the transitions have been seamless. Centennial is a diverse school community and has a large population of newcomers from Syria and other countries. It is accustomed to welcoming new students regularly. 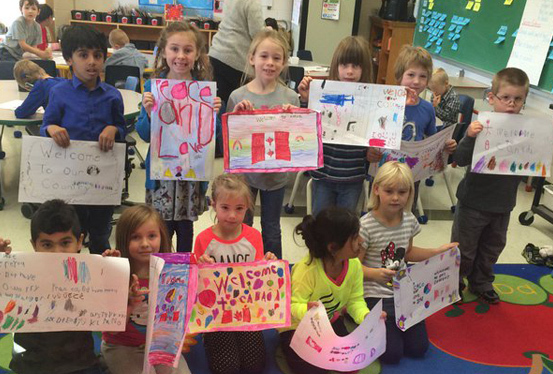 Mrs. Murphy’s class, for example, created welcome posters with messages of support and friendship when Syrian newcomers first arrived to Kingston.